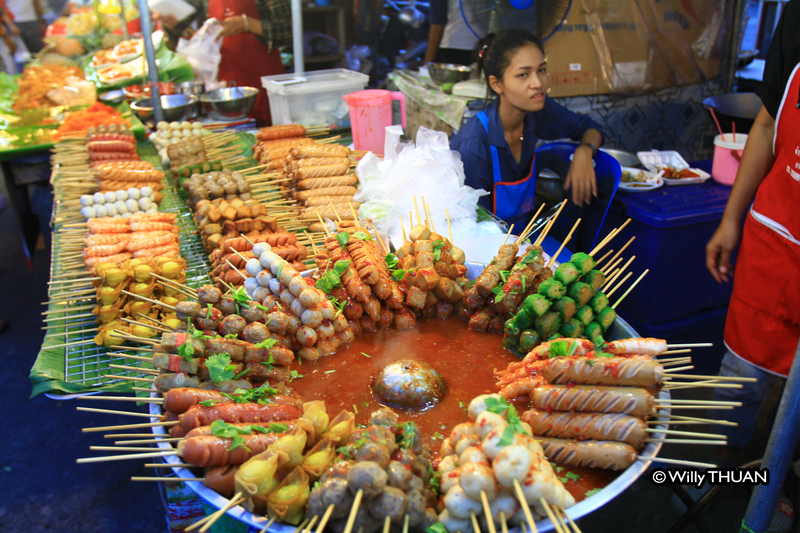 Phuket Street food is fun, cheap but also a great way to experience basic but real Thai food. It is more real than in tourist restaurants you find in Patong Beach. It’s fast and a lot cleaner than you might think. 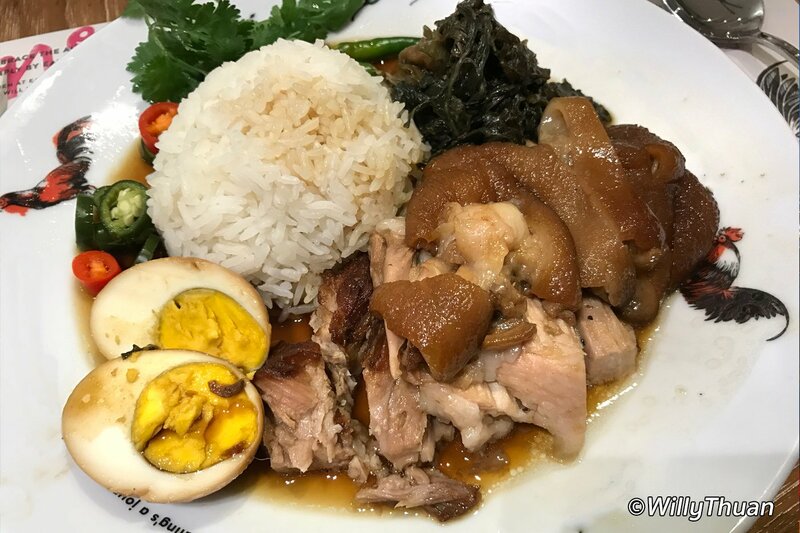 If you have a sensitive digestive system or if you have allergies you might want to skip this, but I think it’s as safe as eating in some restaurants I’ve seen in Patong. 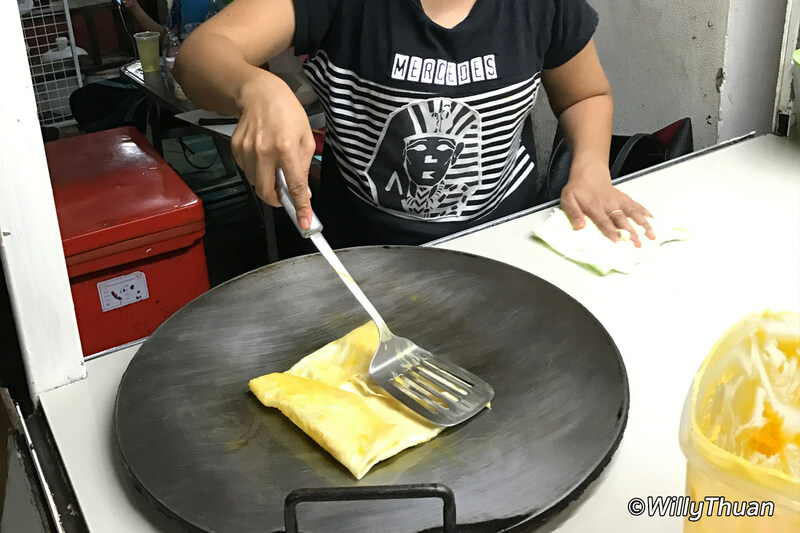 Of course, we also know there is a lot more street food you can find, and we only listed ten most classic items you can eat in the street of Patong and around. Along the beach, you might get some grilled seafood and more in the centre you can expect to find a few types of noodle soups. 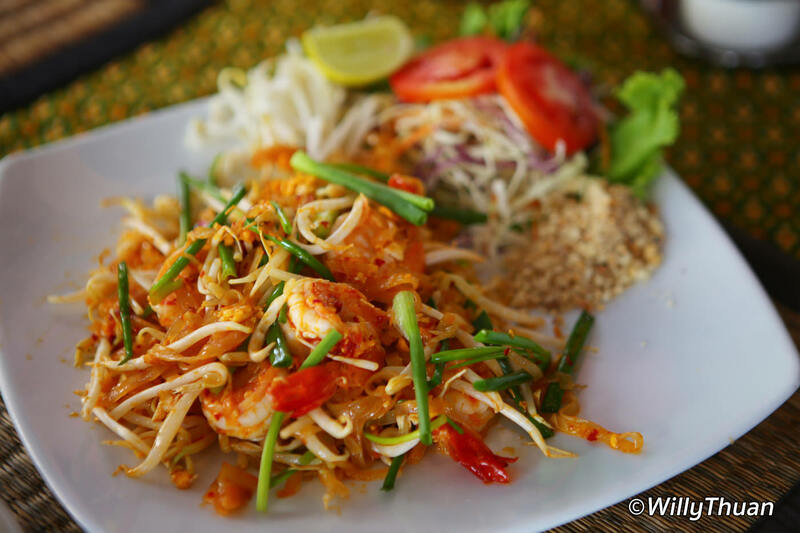 Som Tum with grilled catfish is easy to find, and your Som Tum will be spicier than at the touristic Thai restaurant you tried last night. Pancake is the number one snack or dessert, and almost everyone loves it, whether it uses banana, chocolate, condensed milk, Nutella. Yes, we know It’s called roti, but it sells a lot better when it’s called Pancake, so every cart now advertises these as Pancakes. 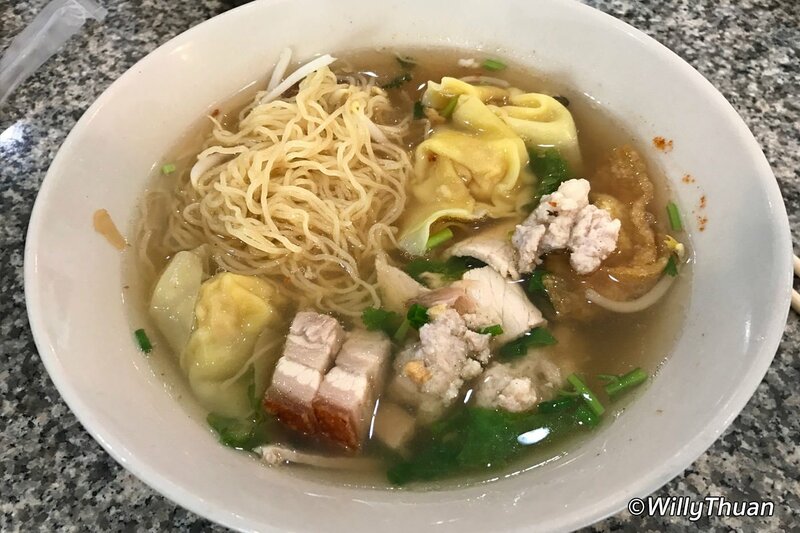 The most popular dish as it comes in so many ways: pork, beef, chicken or seafood, then thick, big rice noodles or yellow noodles. To pick your ingredients, you can point at things usually on display on the carts. 2 words you might want to remember: ‘Mai Nai’ meaning ‘no entrails’ since not everybody likes to find pieces of intestines in their soup. Khao Pad is another super classic dish. 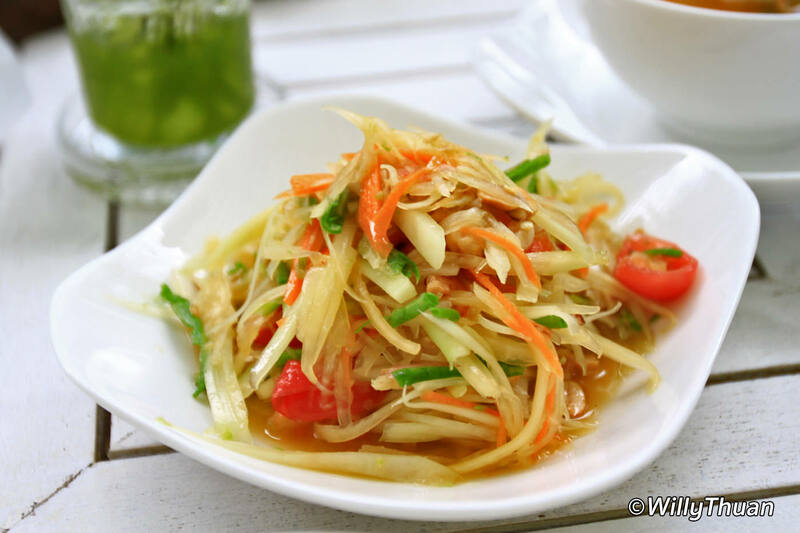 It can be cooked with pork or chicken or seafood and is always served with precisely three slices of cucumber. Don’t know why always 3. It’s even better if you ask for Plik Nam Pla, a bit of fish sauce with chopped chillies in it, gives a nice extra salty punch. Grilled chicken is everywhere, and you have to follow your nose to spot them. Cooked on a tiny cart and more often as a take away than a seated meal, grilled is best eaten with sticky rice (Khao Niaow). Delicious and so cheap! 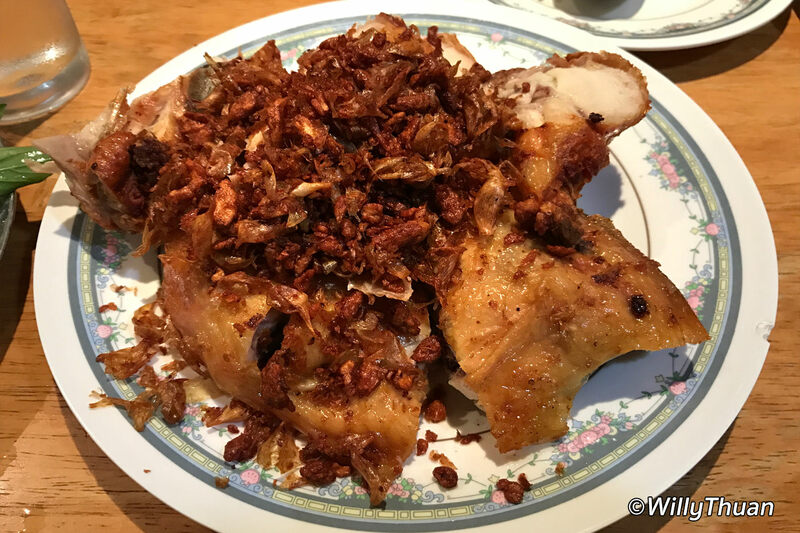 Similar to grilled chicken, Moo Ping is even easier to spot in the streets. Before you can smell it, you will see a vertical column of smoke rushing into the sky. That’s the Moo Ping guy. 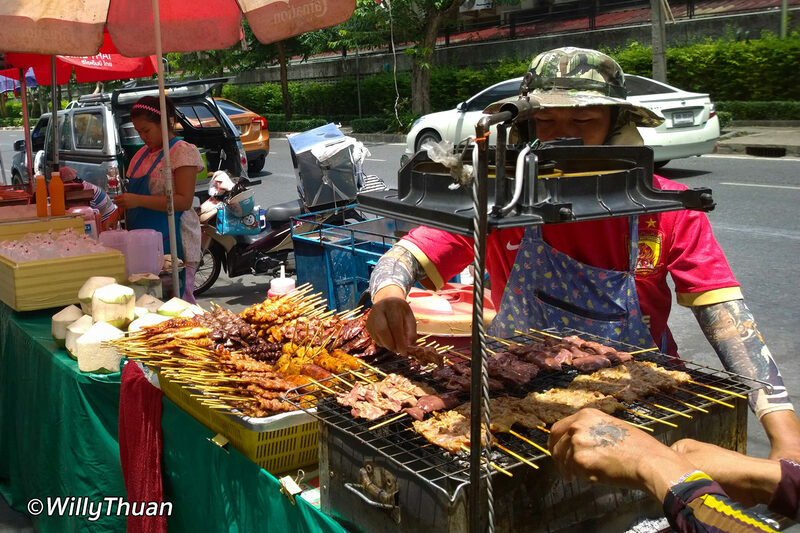 They used to grill those skewers on a little barbecue and use a small bamboo fan until one guy started to use a recycle electric fan to create a powerful stream of air. Double benefit: the fire is always ventilated, and the cook is not in the smoke anymore! Just remember that if you stand next to a Moo Ping cart for more than 5 minutes, you will smell like a Moo Ping yourself for at least an hour. One of my favourites dishes, it’s quite close to some stew we cook in Europe. Here it is a big fat leg of pork stewed and served on rice. Usually served with fat and skin, which not everyone likes. 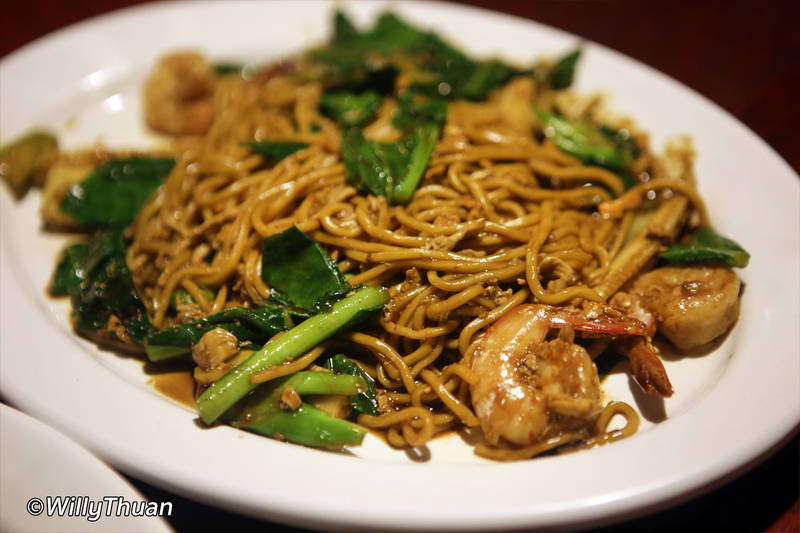 Not the same as Pad Thai since it uses yellow noodles and no eggs. It’s a favorite dish if you don’t eat spicy. 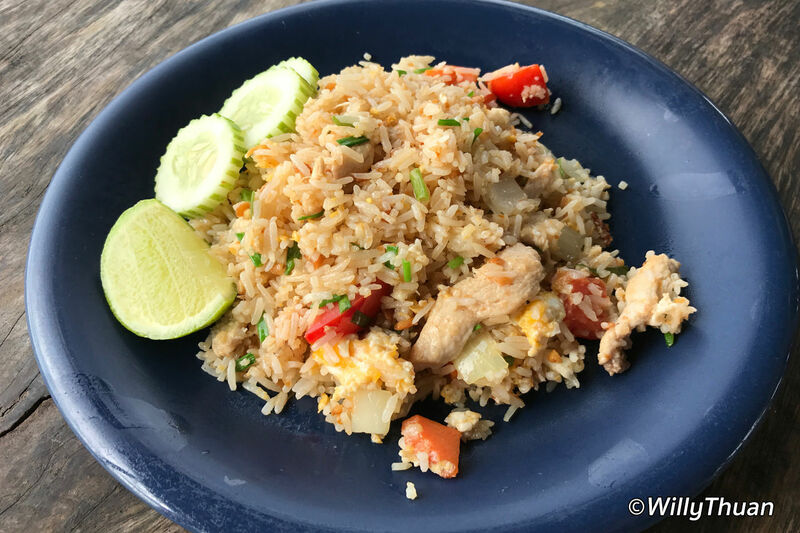 Like fried rice, it can be cooked with chicken, pork or seafood. 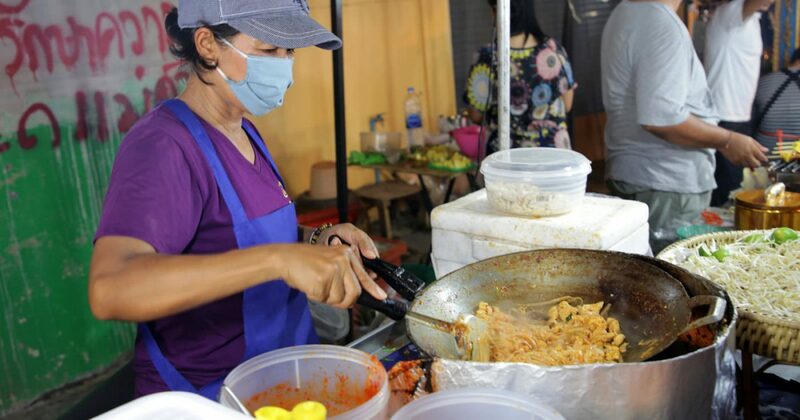 Technically street food is everywhere, but you can find some on the beachfront near Graceland resort, here and there near a convenience store and a lot near fresh market like Banzaan market behind Jungceylon. Prices are fixed and cheap so don’t try to bargain. They might not have a menu so look around the cart and if you don’t see something you like, point at what you see on other customers’ tables. Of course, there are tons of variations but go with basic stuff.